Vitalis produces Marine Pellets a balanced feed for all marine fish with an high protein content and a good concentration of astaxanthin, and this characteristic is curiously not promoted. As you already know, the pellets are made with low temperatures. 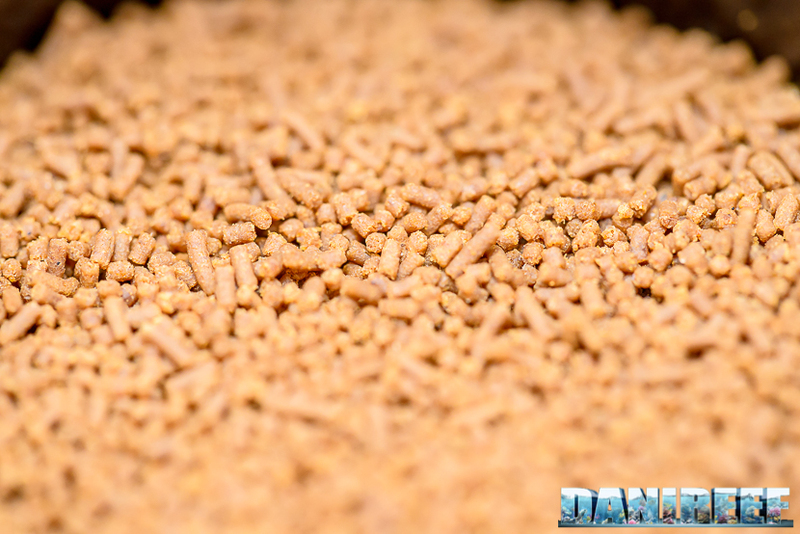 This feature makes it the best feed for aquariums, apparently even better than the granular type. It’s less polluting compared to frozen food and it doesn’t even have the “cold chain” problem. Moreover, it saves almost all the nutritive properties that otherwise are lost with an high temperature treatment, used for creating other types of food (you can find more details here). And it’s produced at even lower temperatures than the granulate. 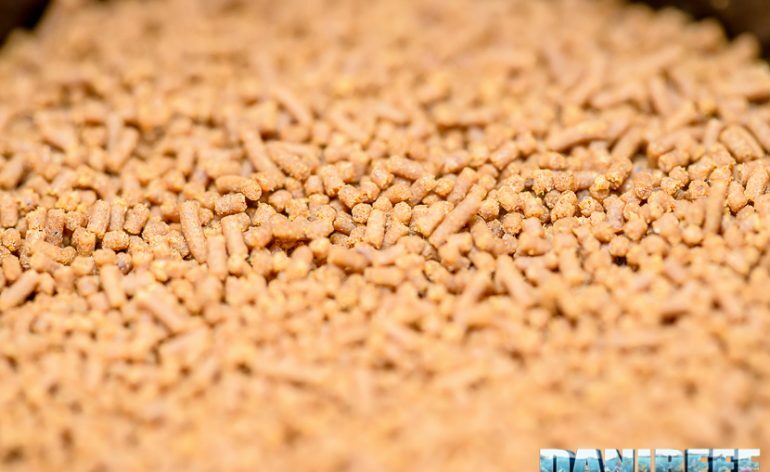 Vitalis Aquatic Nutrition it’s a bran of the english WorldFeed, a company specialized in feeds. So in this case the producer is precisely the one who materially creates and then sells the feed. A good start. 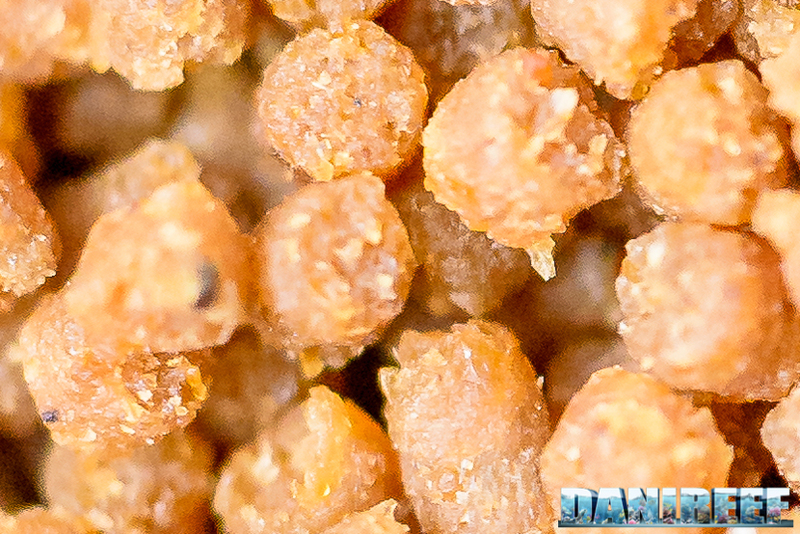 The first thing you notice about Marine Pellets it’s the presence of a good quantity of Astaxanthin. If you remeber few weeks ago we published a study in which there have been done some experiments about the correct contain of Astaxanthin. Yes, they were referring to 400 ppm, while we’re at 133 ppm, but for a generic food it’s a good start for the coloring of the fish. Even considering that other products promote their Astaxanthin content when it’s in much lower percentages. 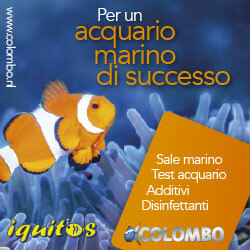 Marine Pellets it’s produced starting from fish flours, with molluscs, crustaceans and vegetal products. It results to be a complete meal for not just herbivores fish. If you have also this kind of fish, consider to administrate also dried or fresh seaweeds, or specific feeds. 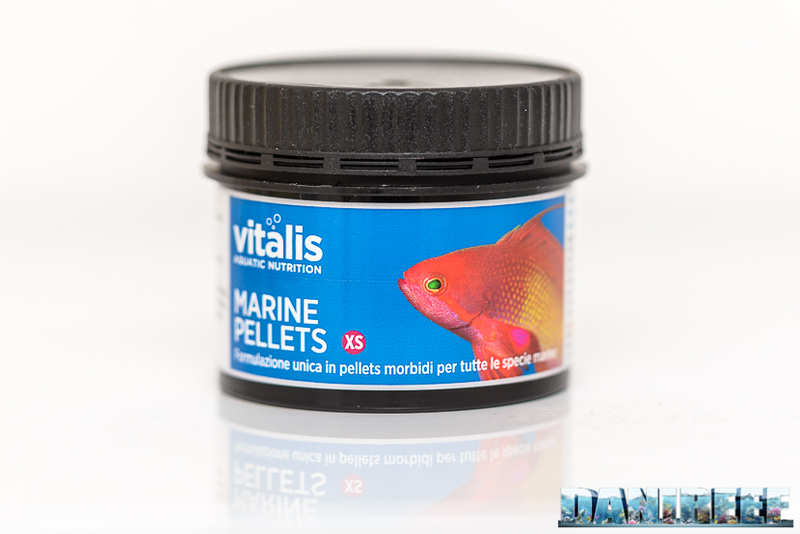 Vitalis Marine Pellets is a granular feed sold in two packages. XS, like ours, or S. The XS has pellets big at most 1 mm, while the S at most 1,5 mm. Even Marine Pellets it’s a feed with a good buoyancy, and I always appreciate this feature in feeds. This time we’re not going to show you the content because all that is included it’s here in the picture. It’s a plastic jar without a spoon and with plastic screw and seal as a closure. I think the lack of the spoon is a weird choice, since it’s very useful, and because I prefer not touching the food with my bare hands. Moreover, I’d like to see a vacuum-sealed package, at least for the transport and the stocking. I don’t know how the jar can guarantee. As we can see from the chart, the feed is mainly composed by proteins (the half of the whole contain) and it has 10% of fats. It’s an highly caloric food, fitting for fish that eat other fish and crustaceans. The proteins are close to the average of similar feeds (53,4%), and the fats too (10,2%), the fibers instead are more that usual, 1,7 versus 1,4, and it’s not such a marginal feature when you think that’s over the 20%. The remains are moisture and inorganic material that we can assume it’s what other feeds call “raw ashes”. Curiously the total of the composition isn’t 100, but it’s a bit over at 100,6%. Iodine (anhydrous iodized calcium) 12,4 mg/kg.. In the first comparison between vitamins, we see that the Vitamin A is preponderant as usual. Vitamin A helps a healthy growth, strengthen the sight, defends the skin and it also brings advantages to the fertility. When we consider the added minerals, we see that Zinc, Astaxanthin, Manganese and Copper are mostly present, followed by Ferrous and Iodine. Notice the reddish due to the presence of Astaxanthin. 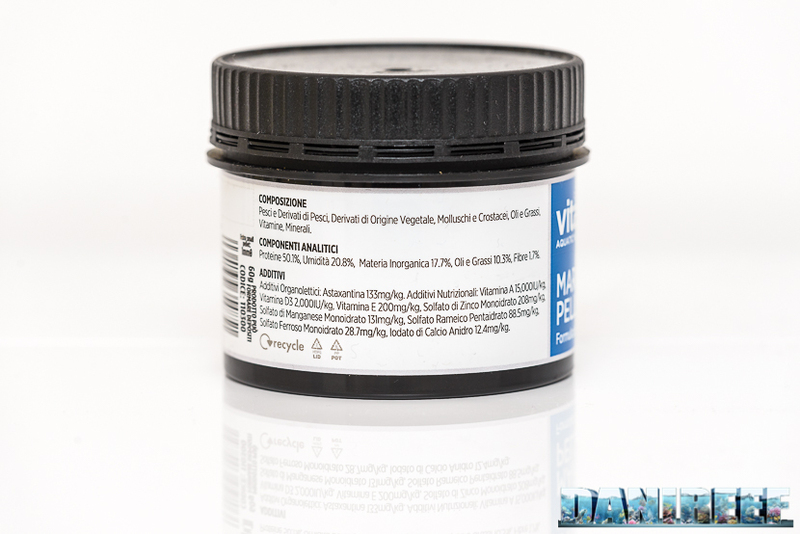 Vitalis Marine Pellets XS is sold in just one package of 60 grams, unless you want to buy the big jar of 1,8 kg! If you’re interested in the S size there are packages of 120 and 300 grams. 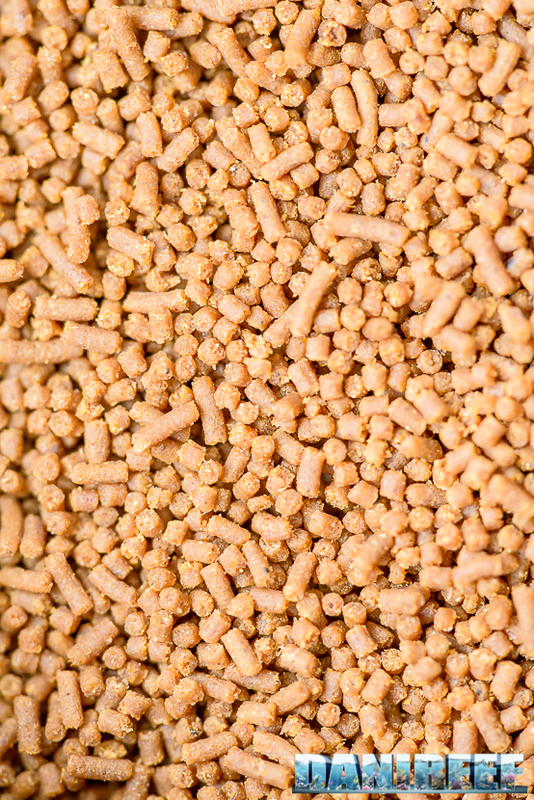 Here above there’s the maximum enlargement we can do of the food, and we can appreciate the combination of individual pellets. The small jar of 60 grams costs 8,5 euro (more or less 14,2 cents per gram). For a comparison: Hikari Marine A costs 8,3 cents per gram, while the smallest Hikari Marine S 11,2 cents per gram. 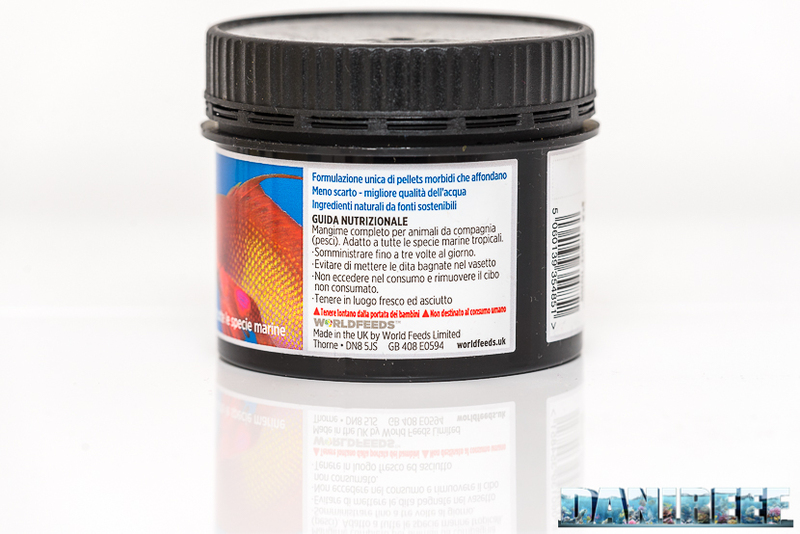 And there there are the 10,4 of New Life Spectrum, 11,3 of XAqua Marine, 21 of Equo Menu Marino, 29,5 of Elos SVM2, 15,6 cents per gram of Unica Gran Premium Plus and 12,3 of AquaForest Marine Mix S.
For a deepening on fish feeds here here’s our article of some years ago, but still actual: the fish feeding.